ASUS already makes everything else, so why not AIO coolers and power supplies? Look out for all these new ROG products announced at Computex in the second half of 2018. Details in the advanced press release were scant, so we linked to the relevant pages on the ASUS website for additional features and product specifications. 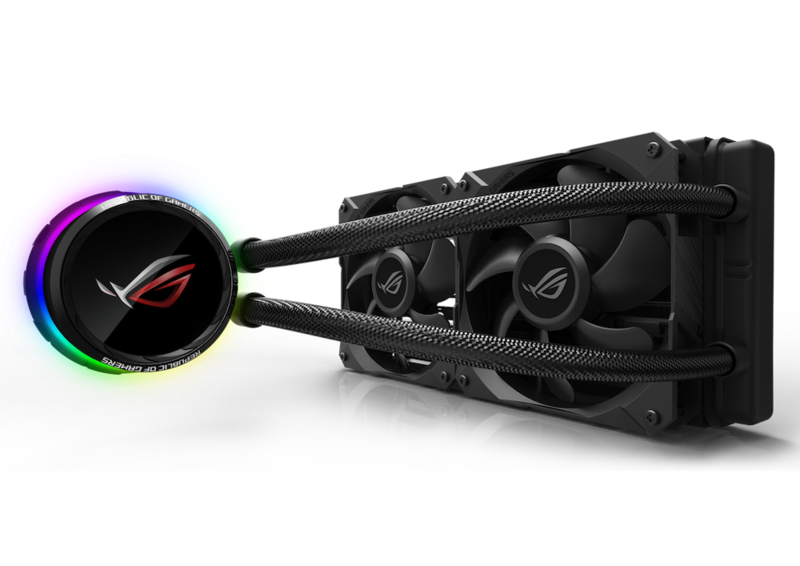 The Ryujin line is ROG’s “flagship” cooling offering with radiators of 240mm or 360mm. What makes these unique is 60mm fan in the pump housing to push air away from the VRMs and socket area to keep all the components cool. As enthusiasts have come to expect with ROG-branded products, ASUS has included top of the line PWM fans from Noctua on the radiator. It would not be ROG without some bling, so also included is a LiveDash color OLED display with live system data or personalized images. 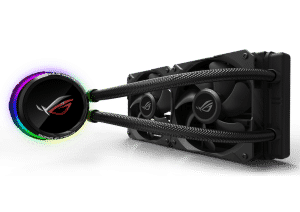 For a system with a smaller footprint, or a gamer with a smaller wallet, ROG is releasing the Ryuo with 240 mm or 120 mm radiators. It features the same OLED display, but fans are Wing-Blade ASUS fans. Power supplies are another expansion area for ROG, with their first entry being the Thor 1200w Platinum. This beast is based on Seasonic hardware with custom heatsinks and an insane 10-year warranty. It is fully compatible with ASUS Aura Sync lighting and will display live PSU wattage data on an OLED panel. Later on, ASUS will release an 850w version for more moderate rigs. 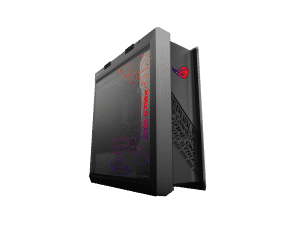 Now that we have a cooler and a power supply, ROG suggests we strap them into their newest case, the ROG Strix Gaming Chassis. The aluminum case is fully compatible with ASUS AURA Sync lighting and features a smoked glass window. Rounding out the features are tool-free SSD mounts, magnetic dust filters and handles making transport easier. For the gamers out there, ROG is showcasing their latest peripherals, including the Gladius II mouse, Balteus Qi mousepad, and Delta USB-C headset. Stay tuned for more news from Computex 2018. The PSU looks interesting but AIO is meh. Just one more typical looking AIO on the market. They could at least use some special fans (at least with LEDs). These on the photos look like standard, not even high-pressure series. EVGA sells ram every now and then. And I do recall seeing Gigabyte selling ran with their name in it. But I can't find and links right now. Its not surprising as these OEMs now have complete control over the hardware distribution. If you think about it, these companies just buy directly from manufactures and than stick their own custom glowy marketing stuff onto the hardware and than resell it. Manufactures get their hardware out to more vendors this way, and additionally the manufactures can concentrate on getting their enterprise gear straight to customer by way of Dell/HP/IBM/etc. It will be fun to see the ASUS+GIGY+MSI builds in the future lol. I would like to see these ASUS PSUs in action. 10yr warranty is pretty awesome and worth it if the price tag is reasonable. I picked up an EVGA PSU just for that 10yr warranty. Yeah, its kind of said the most OEM don't make what they sell. How long has it been since Asus made anything themselves? You have to get into the world of industrial computers until you see most OEM's making their own hardware. the rads mean more money for asetek. the psu means more money for seasonic. now we just have to figure out who makes the cases and perifs! if they are priced like the rest of the asus rog stuff they will all be at least $100 more than they are worth. id take it if they gave it but i would never buy it gear imo. Nice write up Matt. Any chance we'll get our hands on some of this stuff for reviews? Asus makes their Motherboards, Cellphones, networking gear and the like. Same with other hardware companies. All they do is buy chips from different vendors and put it onto their own boards. It costs less for Samsung to sell the DDR chips to Asus than it is for them to build the PCB and Chips and sell it to ASUS or the like. All of the OEMs I have mentioned (and them some) build the PCB and design the circuits on the PCB. They just don't manufacture the silicon. Thanks, looks like I've missed that. It still looks like they are using old generation of Noctua fans. I have two new series in tests right now and they look totally different. On these photos/renders it looks more like earlier Redux series. I can tell you that new Noctua fans, which will be presented on the Computex too, perform great. Can count on about as good performance from 120mm fan as from typical 140mm installed on radiators in popular AIO series. If I'm right then ASUS was only designing motherboards and someone else was manufacturing them (Pegatron which became part of ASUS corp. some time later and one more company). ASUS higher series motherboards were manufactured in the same factory as ASRock for a long time while someone else was manufacturing all lower series for ASUS (which had much higher RMA rate but that's other story). I can't find full info as everything in the web is somehow modified and nothing is whole truth as I remember it (I started my work in distribution when ASRock was created and I had direct contact with some motherboard brands). Now all looks different, some companies keep their brands but are part of other corporations. OEMs are still important but barely anyone talks about them. What is the most important is how end-users see brands. 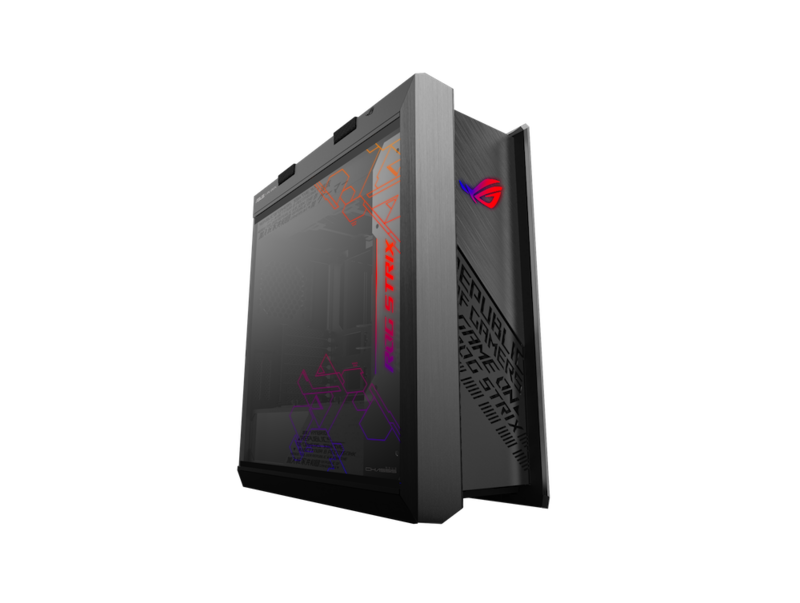 Everything with ROG, Aorus or any other popular logo will cost more and gamers will faster pick these products regardless what is inside. You can see that some standard series get LEDs and higher series logo ( look Strix series ) and automatically users think it's good while it's just a standard product with LEDs. The same is with Gigabyte, MSI etc. Hmmm I need to do some reading, I was pretty sure that ASUS and ASrock have their own manufacturing capabilities. Same with Gigabyte and MSI. I don't think they use Invintec/Foxxcon/Wistron etc. But I could be wrong. If they are following/leading the pattern like the rest of the industry, than these OEMs still design the motherboards, but let the ODMs do the layout and the like. For ASUS and ASRock it was changing in the past years. Now ASUS has their own factory as they took over some other companies (something about it is mentioned in the web but I wasn't really checking details). Till about 2012 they were using some OEMs. MSI was for sure using OEMs as when I was starting my work in IT then they were branding their motherboards with stickers covering OEM PN/SN. I think that Gigabyte had their own factory but I'm not really sure. If you read some more then you can find info that ASUS had their lower series motherboards from the same factory as the lowest quality brands like ECS. ASUS highest series motherboards and later whole ROG series was from factory shared with ASRock ... all, even the lowest series ASRocks were from the same factory as top ASUS ... still it wasn't their factory till at least ~2009. I wasn't following all news and since about 2012 there were many changes so I'm not sure who is using OEMs for what. I just don't think that matters who is manufacturing products but if they're good. I wish to see less motherboards on the market but better prepared. There are many motherboards with little differences that are sharing the same issues. A lot of new series base on the same PCB design. Some are just painted in 3 different ways and it's promissed that one is stronger and the other overclocks better what is pure marketing. I just feel like we are beta testers who should be happy because everything has RGB lighting. Quality of new platforms is in big part Intel and AMD fault as a lot of problems come from their side and later motherboard manufacturers have a hard time to solve everything in expected time. 100% on the spot. Trust me there is no real difference between all these different manufactures for x86 hardware. They all use the same manufactures for the most part, which in tern uses the same teams across different companies. Things are shared, pulled, pushed, and prodded together to make a product some company wants based on marketing desire. What matters is the engineering teams based at home watching these OEMs and making sure they meet the criteria. Your lead boards will always perform better than the derivatives. Th pump has a 60mm fan for stirring up air in the VRM section. That's kind of different. How much air it moves and if it is effective is another story.